The VHEC annual report provides an in-depth, comprehensive overview of our achievements from the preceding year. The 2017 – 2018 Annual Report highlights include: The Renewal Project, Education Programs, Symposia, Public Events, A New Collections Management System (CMS) and Abbreviated Financial Reports. The VHEC produces a highly regarded, professionally designed magazine, Zachor (Remember) three times a year. 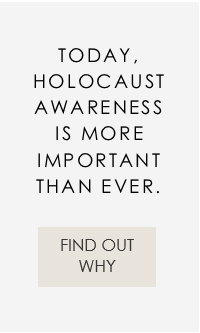 This publication communicates with VHEC members and the wider public about the Centre’s programs, events and current issues related to human rights, social justice and Holocaust education. The Winter 2019 edition of Zachor features an article about the new VHEC, a look at upcoming events and many other articles. A generous donation from Morris z’l & Yosef Wosk in 1999 allowed the Vancouver Holocaust Education Centre to establish the Wosk Publishing Program at the VHEC. The program’s first juried competition took place in 1999 and attracted a number of manuscripts. The jury selected local survivor Michel Mielnicki’s manuscript Bialystok to Birkenau: The Holocaust Journey of Michael Mielnicki (as told to John Munro). This book, with an introduction by Sir Martin Gilbert, was co-published with Ronsdale Press, in the fall of 2000. Edited by Roberta S. Kremer, co-published by Berg Publishing in 2007. By Rhodea Shandler. This memoir by a Vancouver survivor was co-published by Ronsdale Press in 2007. By Leon Kahn. A memoir by a Vancouver survivor, co-published by Ronsdale Press in 2004. As told to John Munro. This memoir by a Vancouver survivor, with an introduction by Sir Martin Gilbert, was co-published by Ronsdale Press in 2000.